The CADWAGO research process is led by Neil Powell (SEI) and managed by Annemarieke de Bruin (SEI). It is based around four research lenses and nine cases. The figure illustrates how three theoretical lenses (the orange core) are applied to a set of case studies to reflect on water dilemmas manifest in a diverse set of transnational contexts. These lenses enable a cross-case narrative describing the orchestration of a diverse set of governance performances (red region). 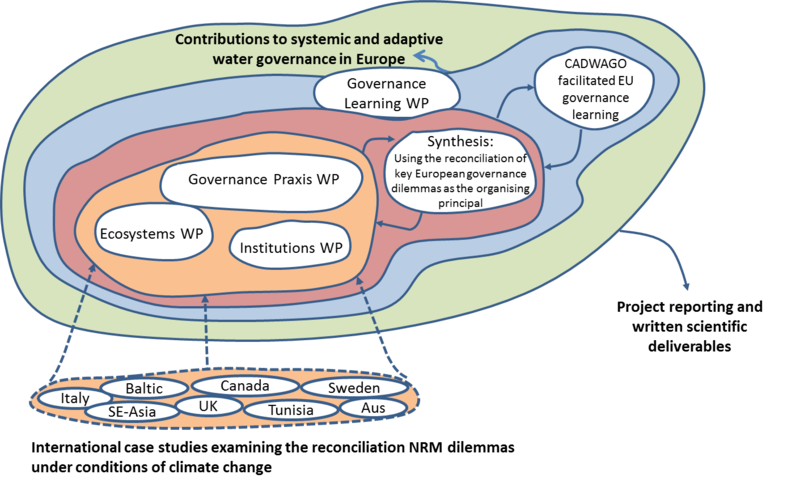 Dialectic between the cross case narratives and champions (reconcilers) of European water dilemmas is facilitated by CADWAGO’s governance learning lens (blue region). The emergent governance learning will enable conceptual, institutional and practice innovations to support systemic and adaptive water governance in Europe (green region).